One of the most important use-case in any cloud is provisioning a VM . In this article we shall do a walk through about an instance(VM) being provisioned in a Openstack based cloud. 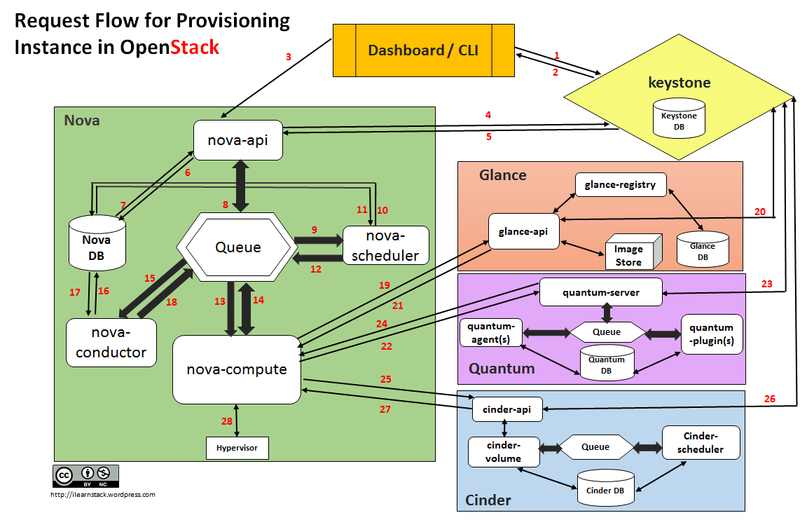 This article deals with the request flow and the component interaction of various projects under Openstack. The end result will be booting up a VM. CLI Command Line Interpreter for submitting commands to OpenStack Compute. Dashboard (“Horizon”) provides the interface for all the OpenStack services. Compute (“Nova”) retrieves virtual disks images(“Glance”) , attach flavor and associated metadata and transforms end user API requests into running instances. Network (“Quantum”) provides virtual networking for Compute which allows users to create their own networks and then link them to the instances. Block Storage (“Cinder”) provides persistent storage volumes for Compute instances. Image (“Glance”) can store the actual virtual disk files in the Image Store. Identity (“Keystone”) provides authentication and authorization for all OpenStack services. Message Queue(“RabbitMQ”) handles the internal communication within Openstack components such as Nova , Quantum and Cinder. nova-api receive the request and sends the request for validation auth-token and access permission to keystone.
" Learn , Earn , Discover and share the knowledge ". I feel enthusiastic in working on Openstack Cloud, programming in Python. Hi! I just want to give you a big thumbs up for your great information you’ve received here on this publish. I’ll be returning for your blog for much more quickly. Pingback: OpenStack Hacker养成指南 | UnitedStack Inc.
back as I’m planning to create my very own website and would like to learn where you got this from or what the theme is called. Pingback: ssssssss | user's Blog! Blog Visits till you viewed now. Cruising the Cloud ecosystem as newbie and avoid getting hit by Lightening.